Last year we advised travelers on how to navigate airline fees, following a slew of fee-based changes during 2012. But as airlines gear up to add yet more fees during 2014, we thought it important to find out what “extras” really matter to airline passengers. And the results are in! 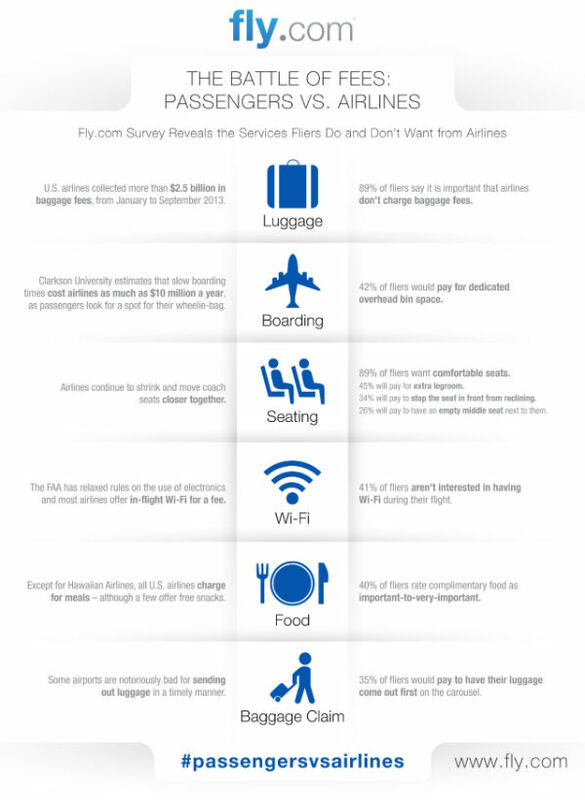 A recent Fly.com survey, which questioned 613 U.S. travelers between January 5 and January 9, 2014, has identified a clear gap between the services that fliers want (and are willing to pay for), and the ones currently being offered by airlines. Not surprisingly, 89 percent of fliers are most outraged by checked baggage fees; a large revenue generator for airlines. According to the U.S. Department of Transportation’s Bureau of Transportation Statistics, U.S. airlines collected more than $2.5 billion from baggage fees during the first 9 months of 2013 alone. However while passengers find baggage fees offensive, our survey reveals they are willing to splurge on dedicated overhead bin space for their hand luggage (43 percent). Furthermore, 35 percent are happy to pay to have their checked luggage come out first at baggage claim. Other services at the top of flier wish lists are ones that improve comfort and efficiency. At a time when airlines are shrinking the size of seats and moving them closer together, 89 percent of our survey respondents felt that comfortable seats were a prerequisite of air travel. As such, it makes sense that 45 percent indicated they would pay for extra legroom, 26 percent would pay to have an empty middle seat next to them, and another 34 percent would pay to prevent the seat in front of them from reclining. At the airport, 36 percent of fliers said they would purchase a fast pass to speed through security. For more information on how ancillary fees stack up between airlines and passengers, check out our infographic below or join the conversation on Twitter: #passengersvsairlines.